Dentistry is a routine part of daily practice. 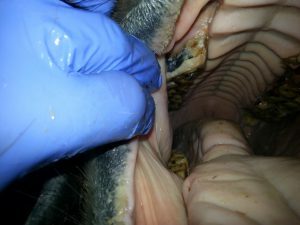 Ensuring your horse’s teeth are kept in good working order will promote their healthy well being by improving performance both under saddle and nutritionally. Equine molar teeth are expected to grind tough hay, softer grass and cereals throughout their life. These teeth are constructed to provide a variable grinding surface to “open up” these feeds as the first stage of the digestive process. As a consequence of continual wear, lips or edges will occur on the check (buccal) side of the upper molars and on the tongue (lingual) side of the lower molars. Other malformations such as hooks, excessive transverse ridges, steps and ramps can occur due to malocclusion issues, where upper and lower arcades are out of step in their grinding action. Here the first upper molars has developed substantial overgrowths or hooks. This was due to misalignment of the dental arcade and will substantially reduce sideways jaw movement. The hook was reduced using a motorised drill. 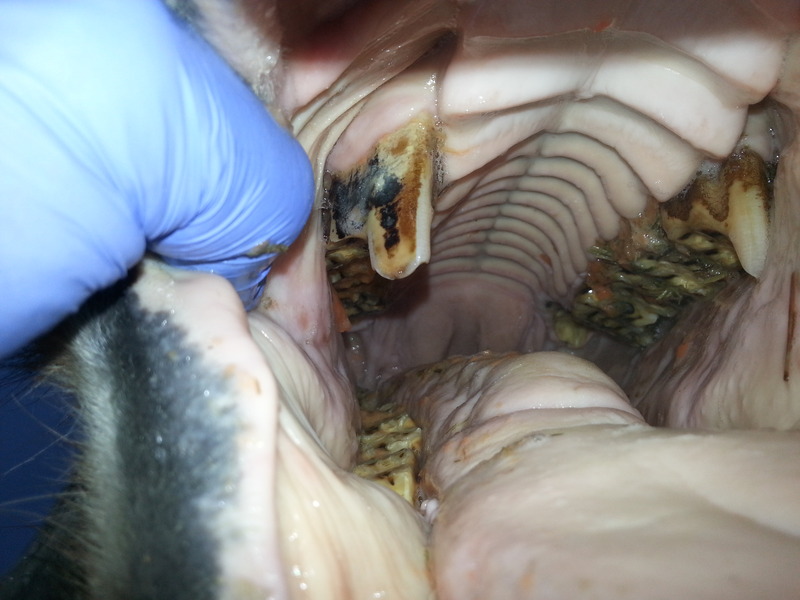 Your horses teeth should be examined at least once yearly, say with the annual vaccination and general health check. If your horse or pony is nervous then a short acting sedative can be given. Sedation allows a safer environment to allow a full examination of ALL the teeth and ensures ALL the molar teeth are treated. Wolf teeth are usually present just in front of the first upper molars. They can come in a variety of sizes and can often interfere with the bit and ridden exercise. Hence they are often removed, though not always. Sedation and local anesthesia is required to remove wolf teeth, whose have long roots can snap if not correctly removed. Extractions of loose teeth can often be carried out on site, using sedation and local anesthetic if required. 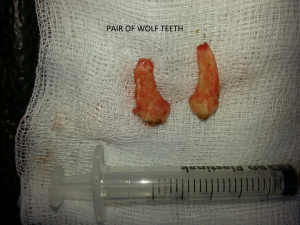 These will generally be older teeth with little crown and short roots. Teeth that require more intricate extraction due to diseased roots or decayed crowns can be brought into the clinic for treatment. This entry was posted in Uncategorized and tagged Dentistry, Rasping, Teeth, Wolf teeth. Bookmark the permalink.